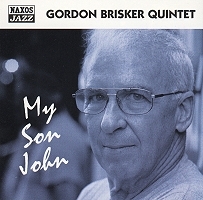 Gordon Brisker needs no introduction to jazz fans. He played lead tenor in that glorious Woody Herman Four Brothers band of 1962. That would have been enough to keep most people going, but Gordon went on from there to work with Lionel Hampton, Louie Bellson, Tony Bennett, Gerry Mulligan, Anita ODay, Bobby Shew, and the Cincinnati Symphony Orchestra. As a clinician and instructor Gordon has taught at the University of Hawaii, San Diego State University, Mana College of Wellington, New Zealand, Cincinnati College/Conservatory of Music, Fullerton College, Ohlone College and the Berklee College of Music in Boston Massachusetts. This is a beautiful recording, both musically and technical. From Mike Nock's truly exciting piano, coaxing along playfully behind the soloists, then exploding into almost volcanic energy when he takes off in full flight, to Billy Hart's spirited drumming. Billy should know how to do this in a group this size, having already done so with Wes Montgomery, Herbie Hancock and Stan Getz. But driving them all there is Anthony Cox, one of my very favourite bass players. Tim Hagans is sheer delight to listen to, as always; one of my very favourite trumpet players. Brisker plays inspirational solos on these takes, with that pure tenor sound that we knew and loved in the old days, before it became fashionable to attack the horn with malice aforethought. Brisker is cool, and I like that in a man.